Mesut Ozil and Aaron Ramsey haven’t travelled to Belarus but Eddie Nketiah is in the initial squad for Arsenal’s Europa League clash with BATE Borisov. 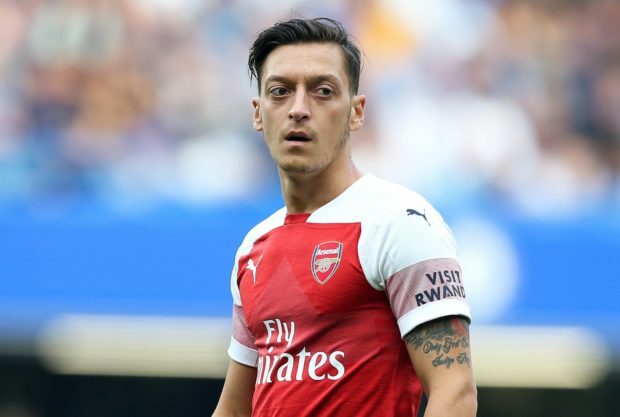 Ozil missed the 2-1 win over Huddersfield at the weekend due to illness but it looked like he would be in contention to take on BATE on Thursday evening after returning to full training ahead of the game. However, the German playmaker has been left in north London along with Ramsey as the Welsh international is still recovering from a knee injury that kept him out of action at the weekend. Sokratis returned to full training today after making a swift recovery from an ankle injury but the centre-back hasn’t been risked for the Europa League last-32 clash tomorrow evening. Dinos Mavropanos, Joe Willock and Carl Jenkinson also miss out on a place in the travelling squad but young striker Eddie Nketiah was on the plane that flew out to Belarus earlier today. Pierre-Emerick Aubameyang is also in contention after recovering from illness while Granit Xhaka returns after shaking off a minor groin problem that’s kept him out of the last two games. Denis Suarez is pushing to make his full debut after making a couple of substitute appearances since joining the club last month while Petr Cech is expected to be involved as he’s been our usual goalkeeper in the Europa League. It’s certainly a much stronger squad than some fans were expecting and I’m glad the boss hasn’t taken too many risks for the first leg.